That name's quite a mouthful, isn't it? Actually, I think the full name is Anastasia Beverly Hills Illumin8 with Youthful Synergy™ Complex Eyeshadow Palette. I get winded just typing that. Despite the epically long name, this eyeshadow is pretty awesome. It does say that most results were seen after four weeks of use. That means, in order to properly test and review these, I'd have to wear the same eyeshadow for four weeks straight! You all know me well enough by now to know that's pretty much and impossible task for me. After all, my favorite thing is variety. But, I did pretty well. 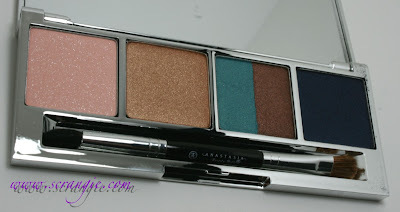 I had enough of a variety of colors that I was able to make it the whole four weeks wearing mostly the Anastasia shadows. More on that after I show you the gorgeous colors. I tried two palettes, #4 and #5. The #4 and #5 palettes are brand new for 2011. 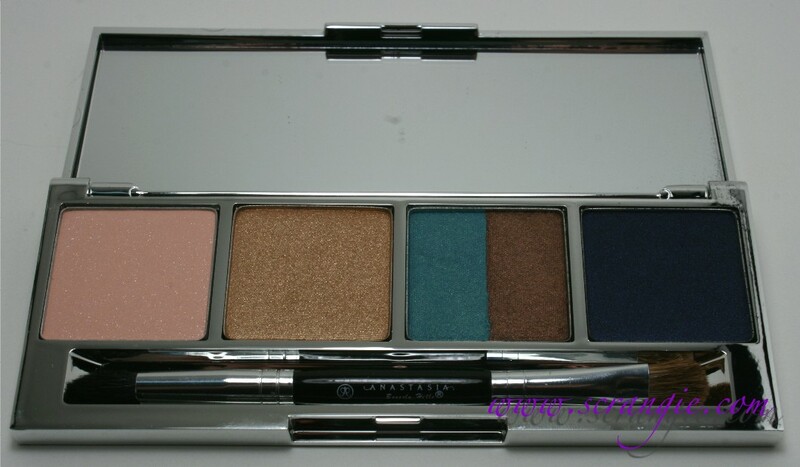 The front of the palette is this stunning mirrored silver with the Anastasia Beverly Hills logo printed on the top side and a regular label sticker on the underside. Reminds me a bit of the ModelCo holiday palette from a few years back... anyone remember that? This is the #4 palette. 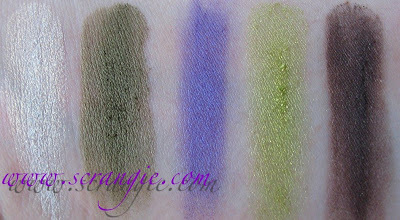 It contains five shadows (white with gold glitter/shimmer, drab olive shimmer, duochrome purple/blue shimmer, lime green shimmer, deep green brown shimmer) and a double sided brush which is actually of decent and usable quality. I mention the quality of the brush because often the brushes that come with palettes are cheap and useless. 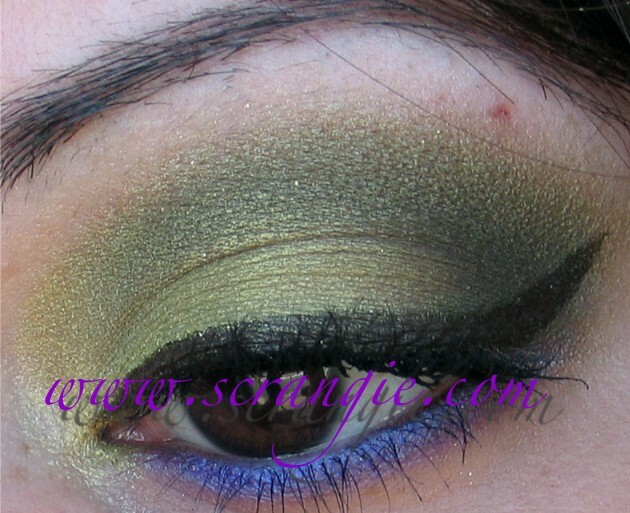 This one's a little on the scratchy side, but I was able to use it to do my whole look. You may like to enlarge this to see the shimmer in the shadows and the duochrome effect on that marvelous purple. 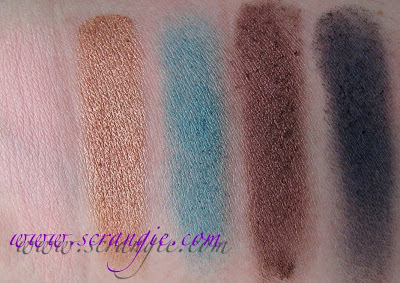 Here are the #4 palette's shadows in order, swatched dry over bare skin (no base). I believe the shadows are named, but the names are only numbers, 1-5, in the order that they appear in the palette. 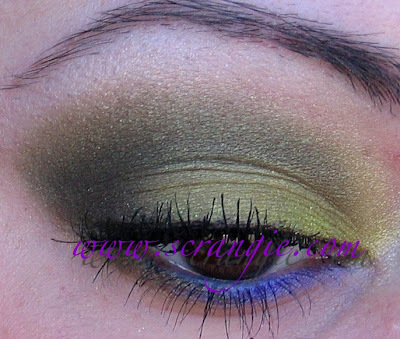 The colors in this palette are so utterly gorgeous on my brown eyes... I'm in love with it. 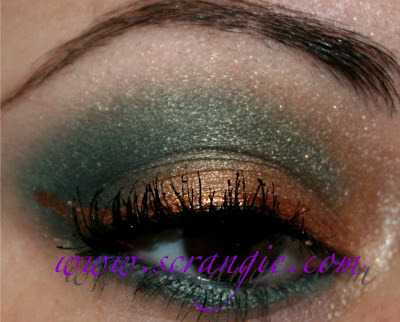 A pale peach-pink with large glitter/shimmer, a metallic bronze, a deep teal shimmer, a metallic brown and a dark blackened navy shimmer. You can see the sparkle in the pink best in this picture. Like always, click to enlarge and see it in full detail. 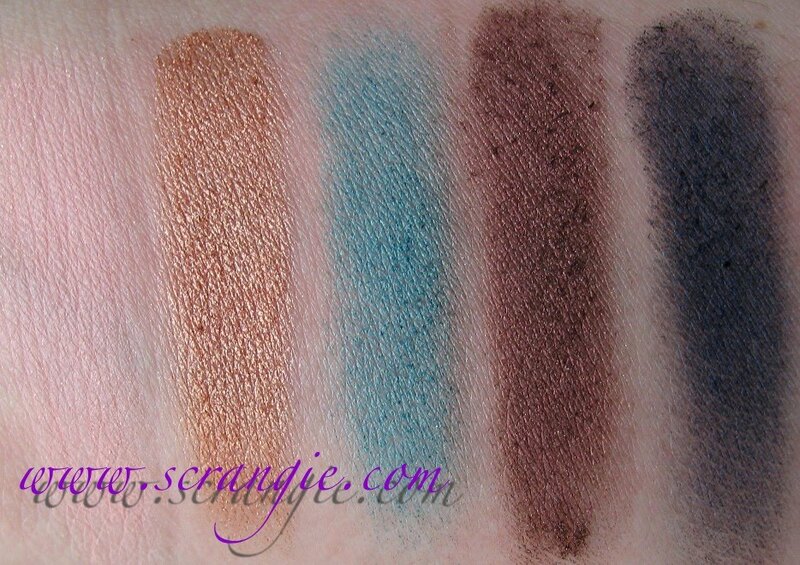 The #5 palette, shades 1-5, swatched dry on bare skin (no base). You can just barely see that pink on the far left; it's nearly the same color as my skin. Only the contrasting warm tone and slight sparkle gives it away! I mention that I swatched these dry only because the company suggests that they can be worn wet or dry. 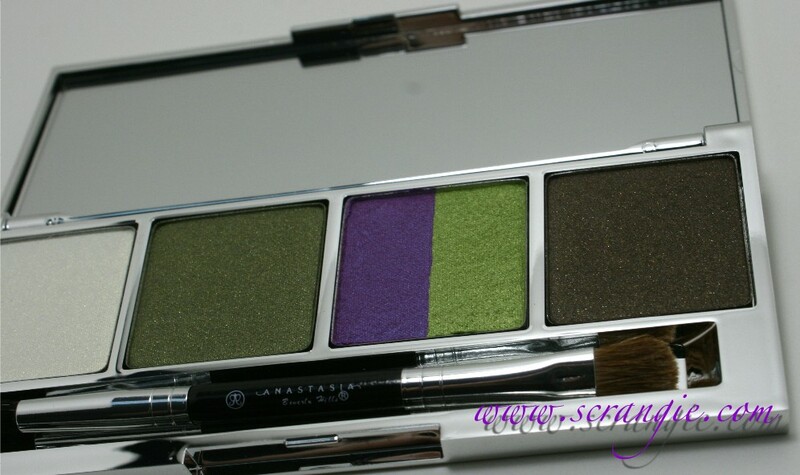 I have not used them wet, the pigmentation and payoff was good enough that I just didn't need to add an extra step! 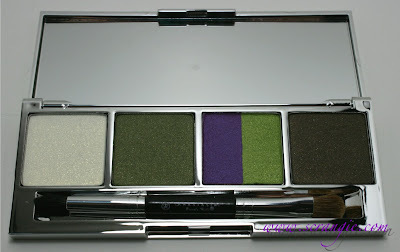 The texture of the eyeshadows is slightly varied, but overall nice. The pigmentation on most of the shades is excellent. The least pigmented shades are the teal and navy in the #5 palette; I needed a to layer them a few times to build a good, opaque layer of color. The rest of the shades are marvelous. About half the shades in these palettes are smooth and the other half have what I can only describe as a creamy-scratchy texture. They feel smooth and silky but at the same time have a little bit of a roughness to them, which is odd. It may be due to the diamond core powder that's included in the formula for these shadows. Like most shadows, there's a little fallout when applied with a brush, but nothing significant. It's mostly just with the darker shades as they seem to be more powdery textured than the others. The blending on these is a dream. They blend effortlessly and seamlessly. I'm very impressed with how well even the dark navy blends without streaking. The only major downside for me is that the beautiful bright lime shade in the #4 palette seems to fade and dull after wearing it for only an hour or so. It doesn't disappear or fade away completely, but it does lose its edge. It doesn't look as bright and fresh as when it's newly applied. 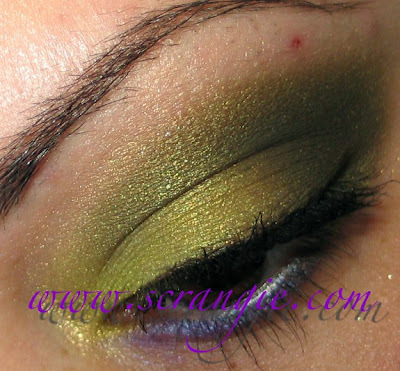 This is using all the shades in the # palette, all over a base of Too Faced Shadow Insurance. 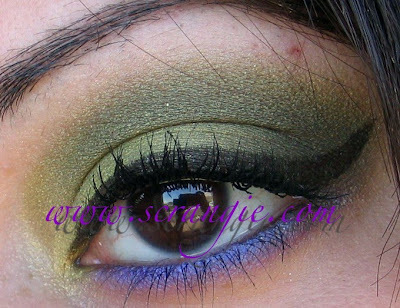 The lime shade on the lid, the olive in the crease with the dark green-brown in the inner crease to deepen it and the blue/purple duochrome on the lower lashline. I tried the white and gold shade on my browbone as a highlight but it was too white and frosty so I wiped most of it off. Instead, I dabbed a tiny amount onto the very center of my lid, just above the pupil, to add a bit of a dimensional effect. I used Cargo Khaki eyeliner to do the subtle line along the lashes. The difference here is that I added my beloved winged liner (Stila Stay All Day Waterproof Eye Liner in Dark Brown), used only the purple on the lower lashline and didn't use any of the white. 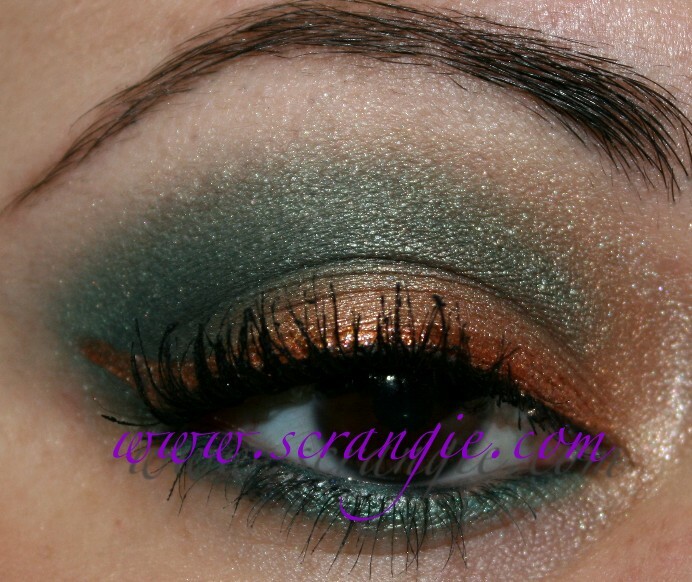 This look uses the #5 palette over a base of Too Faced Shadow Insurance. It's the bronze shade on the lid, the teal in the crease and on the lower lashline, the navy used very lightly in the outer V just to deepen it and the pale pink on the browbone. The liner is Stila Glitter Liner in Kitten. So, what about all those skin-enhancing, line-smoothing, anti-aging claims? Well... to be honest... I'm undecided! Results may vary, though significant results were seen after 1 hour of application. I gotta say, I'm always extremely skeptical when it comes to products that make claims, but this actually did do what it said for the most part. 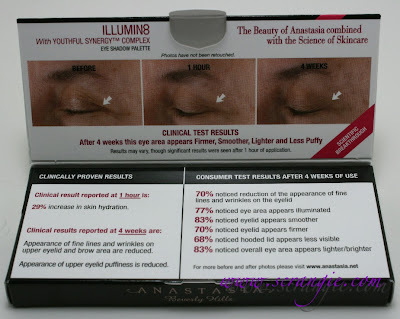 My eyelids looked and felt better without makeup after consistently using these. Nothing crazy dramatic, and probably not noticeable by anyone other than me, but I did see a difference. I liked the lightening/brightening effect the best, as darkness in my eye area is one of my main problems. But, like I said, no wrinkles yet (*knock on wood*) so I can't say whether or not it helped in that area. After using these, I would definitely buy them again. I'd probably pick only #4 because the colors are just so absolutely perfect on me. I actually wanted to wear it for a week straight. Seriously, it's gorgeous. 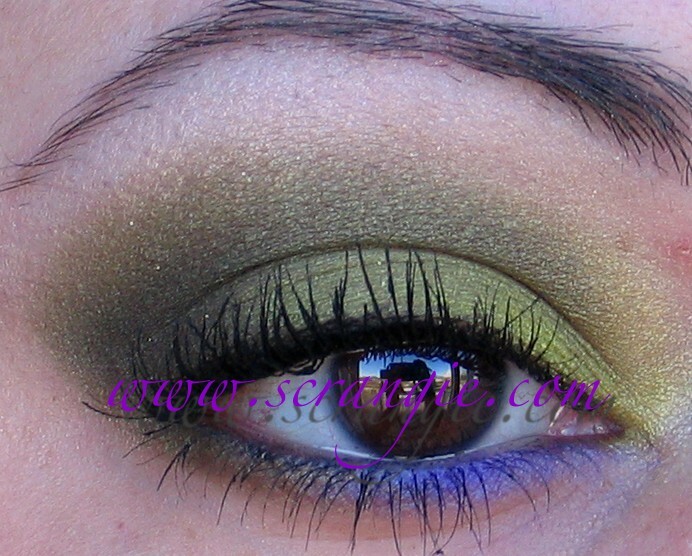 It has purple duochrome and lime green, what more could a brown eyed girl want? These shadow palettes are marginally pricier than other peer/midrange brands at $40 a piece for five shades. You do get a rather large amount of shadow for the price, though. According to the manufacturer's ingredient list, each single/duo is 10g/0.063oz. If I'm understanding the wording correctly, that's pretty much a full size shadow in each pan. For comparison, a full-sized NARS shadow is just slightly larger at 0.07oz and costs $23 for one. An Urban Decay Urban Ammo palette contains ten .03oz shadows (slightly more product than Anastasia's four .06oz shadows) and costs $38. So, fairly reasonable price, good amount of shadow, nice packaging, decent brush, good color payoff, pretty, well-coordinated colors and the lovely added bonus of a skin-improving formula. I really, really love that they actually do something to improve your skin while you're wearing them instead of just sitting there doing nothing. 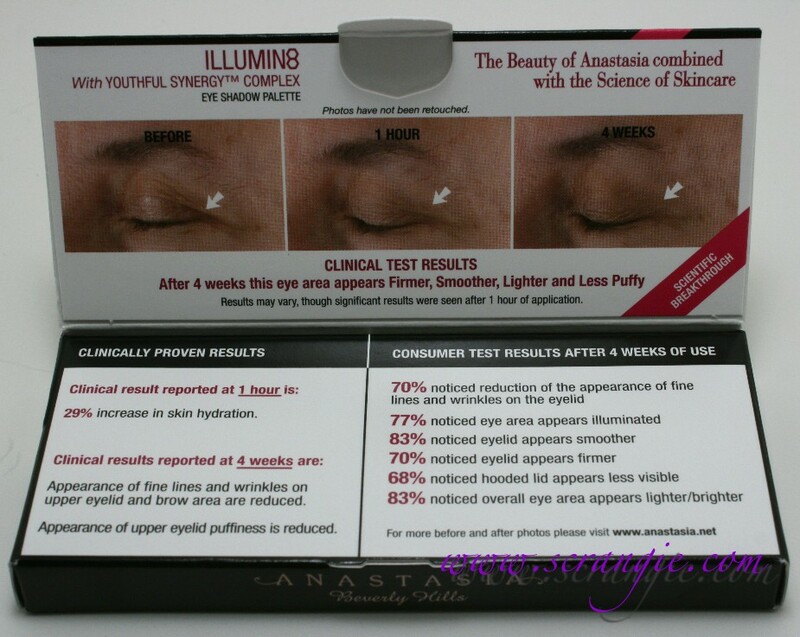 More brands should follow Anastasia's lead and make anti-aging shadows. I just love products that work overtime. These are available at Sephora and the Anastasia Beverly Hills website. I love palettes and am always looking for new, good quality ones to try. I would get this for my mom, who is obsessed with anti-aging thingamajigs, but she doesn't wear eyeshadow. And I've been trying to get her to for the longest time! Maybe this palette will convince her. Hmn, I might actually try these! I am trying to minimize my eyeshadows to just a couple palletes for daily use so if wearing the same thing daily helps my skin it'd be a good thing to use! I am on a bit of a makeup ban for now though so I'll just put this on my shopping list to get in a few months. I know I certainly could use the "illuminating" effect as my lids are darker than I'd like...also interested in the "hooded lids" thing since mine are a bit, I am skeptical about that but it can't hurt to try especially since that's not the only thing I want out of it. I'm impressed with these shadows too. Initially, I bought a few palettes just because I just needed some basic shadows and wanted something new. You know, a group of coordinated shadows for a decent price. The anti-aging/de-puffing effect is just a happy bonus. I haven't worn another brand of shadow in months, mostly because these are so easy to wear. The anti-aging/de-puffing thing mostly helps me look a bit less tired. On my face, that's what growing older has done. Not a ton of wrinkles, but I just look kind of tired, even when I'm not. I love being able to wear these without much thought. I wasn't as impressed with #4 as you, though, The whole grittiness issue was kind of a turnoff. Sparkle and glitter are NOT the look I want, even in moderation. What gorgeous colours! They look fabulous on you! Love those greens, they're so faltering on you. I don't know if I believe all claims of these shadows. OMG ! These colors are so gorgeous. And the blends are really amazing. Doesn't using a primer block the benefit of the eye shadow?